At Mornington Mazda, our workshop utilises the most up-to-date equipment, purpose built to support the Mazda maintenance program. Our team comprises award-winning factory trained technicians who ensure accuracy and timely analysis of your vehicle. ARE THERE DIFFERENT SERVICING OPTIONS? If you are due for a minor service, you might be eligible for our Quick Smart Service - It's the same great service, just faster. Our team of technicians work to have your Genuine Mazda Service completed plus your vehicle washed and vacuumed all within an hour! 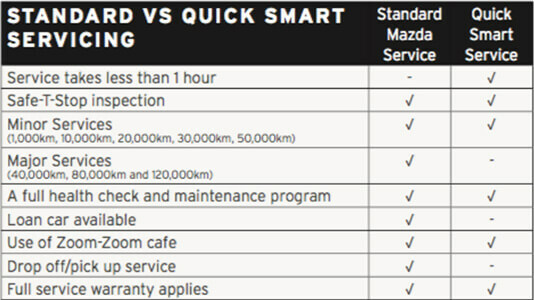 WHO IS ELIGIBLE FOR QUICK SMART SERVICING? 1,000km, 10,000km, 20,000km, 30,000km, 50,000km scheduled Mazda Book services. Excluded are major services: 40,000km, 80,000km and 120,000km as we require your vehicle for a minimum of four (4) hours. IS THERE A SERVICE SCHEDULE I NEED TO KEEP TO? Mazda's base scheduled maintenance is due every 10,000 km, but no longer than 12 months, whichever comes first. Sometimes there are items which require replacement at the time of your service but do not fall within normal service charges. If this occurs, you will be advised of and quoted on before proceeding. This can include replacing brake fluid, air filters, fuel filters, spark plugs and transmission services. DO YOU OFFER A LOAN CAR OR PICK UP SERVICE? Yes. We have a fleet of loan cars available for you to use. Just be sure to let us know you require a loan car at the time of booking. We also offer a drop-off and pick-up service if you require a lift to work, home or public transport. Please note we limit this service to 15km from Mornington Mazda. WHERE DO I TAKE MY CAR TO BE SERVICED? Our service department is located on the same site as our showroom. Just drive a little further down the driveway and park right outside the service door. We will valet park your car so you don't have to get wet on rainy days. DO YOU HAVE A SERVICE LOUNGE OR OFFER WI-FI? The Mornington Mazda 'Zoom-Zoom' customer lounge is located upstairs adjacent to the showroom. You are most welcome to enjoy a complimentary café style coffee on us. Stay connected with work or the world using our free Wi-Fi. Customers are most welcome to plugin and make the most of our fully equipped workstations. IS THERE SOMEWHERE KIDS CAN PLAY? The Mornington Mazda 'Zoom Zoom' customer lounge has a children's play pen full of engaging toys. There are newspapers, a television, complimentary Wi-Fi and café style tea and coffee for you to enjoy. We are also located opposite Macdonald's if you are after a more energetic playground adventure with the kids. HOW LONG DOES MY NEW CAR WARRANTY LAST? If you've recently purchased a new Mazda passenger vehicle, you'll be backed by a 3-year, unlimited kilometre warranty that covers any defect in material or workmanship in both parts and panels. If you're the proud owner of a Mazda Bt-50, you'll be covered by a 2-year unlimited-kilometre warranty (or up to 3 years limited to 100,000km if you don't reach 100,000km in the first 2 years). DO YOU SELL GENUINE SPARE PARTS? We'll always recommend you service your Mazda with Mazda Genuine Parts. not only because they help maintain the integrity of your Zoom-Zoom, but because all genuine parts are backed by Mazda's Parts and Panel warranty. DO YOU SELL AND FIT GENUINE ACCESSORIES? DO YOU SELL TYRES OR OFFER ALIGNMENT? We are one of the few dealers with a dedicated on-site tyre centre. this allows us to offer you great prices and fitment all in the one location.